Blogging has given me immense pleasure to develop new friendships and virtual bonds which words fail to describe. Thank you Abhilasha for coming to my rescue and for this guest post on my blog. As you all know, I am on a 2 weeks Vacation (currently in Singapore), and lotta things kept me away from pre scheduling my posts-Blame it on the weather or my lazyness. Abhilasha is a true Inspiration to those seeking Indian style n culture. She is a perfect blend between Contemporary and modern women who doesn't fail to impress when thrown a challenge to look best. If I could describe her style in one word - I would call it Timeless ! 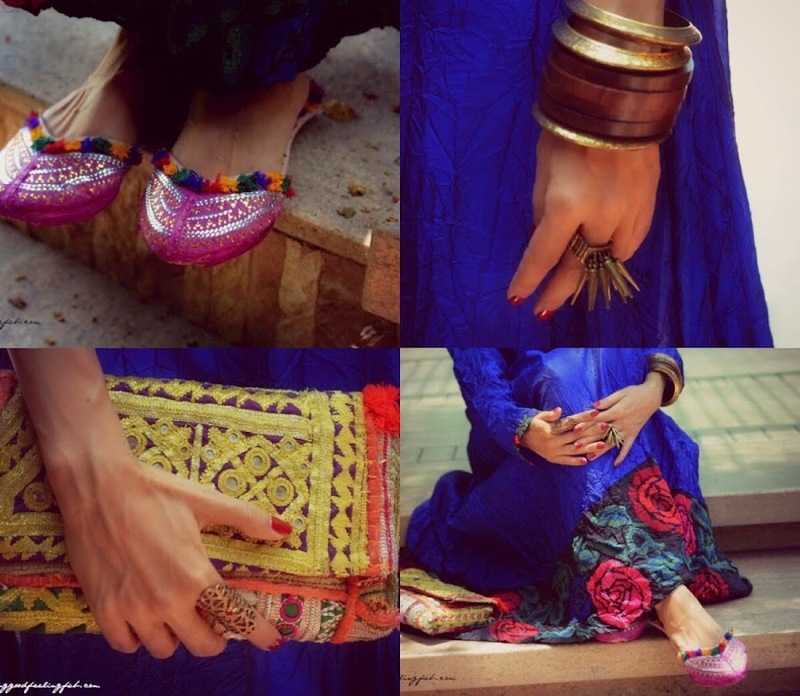 Don't forget to check her wonderful blog and Indian essence which reflects in her personal style. I have had the pleasure of getting to know Surbhi one post at a time over the past year and then recently we finally bonded over a phone conversation and one of the outcomes of that conversation is this. Yes, I am taking over The Fashion Flitewhile she backpacks, shops, spas and holidays in a whole new corner of this beautiful world. I have always admired Surbhi’s fearless style and I am thrilled to be able to share her space and interact with all of you today. So thank you so much Surbhi for letting me be here. A few months back, when the summer heat started to get the better of me, I vowed to not wear denims for the entire summer. It kept me very comfortable during the sweltering summer months and it gave me an excuse to try things I avoid. Since I choose the comfort of denims over treading unknown style territories, this summer challenge was perfect for me. I wore a lot of skirts, dresses and even the scary pajama pants, but what I enjoyed the most was wearing kurtas as dresses and giving them a more edgy funky twist. As I get my jeans dry-cleaned and prep myself to get back into them, I thought of playing with the kurta one more time before the monsoons hit bringing an end to my summer no jeans challenge. The kurta is borrowed, the mojris are traditional Indian accessories, worn by Gujarati brides and the clutch is a modern twist to a traditional craft. Stylish and chic look! Beautiful post, really interesting! Loved the overall look... though mojris grabbed my attention more.! 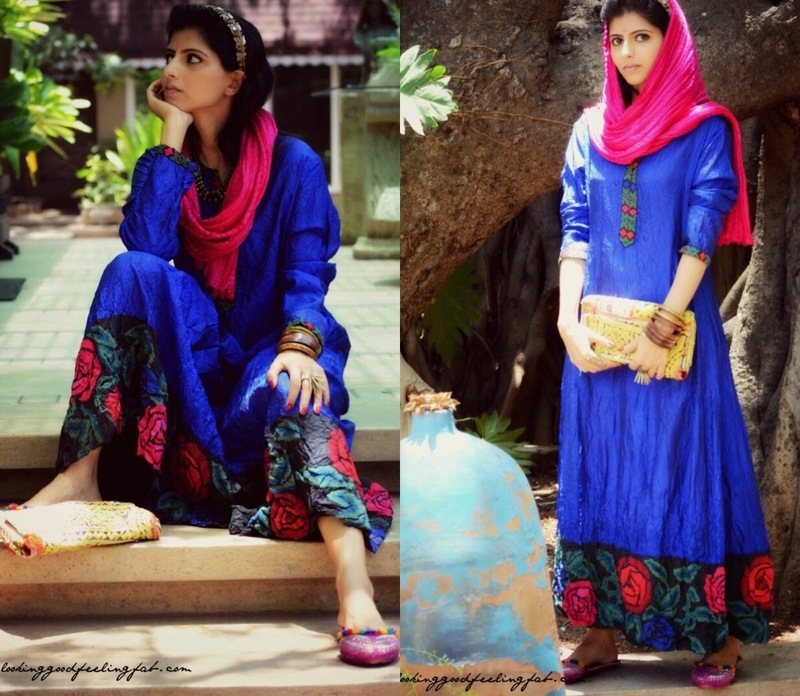 Loved this beautiful outfit, blue suits you so well!! oh wow such beautiful colours!